CHASING FOOD DREAMS: Suria Café, The Saujana Hotel Kuala Lumpur: Celebrating Flavours of Sri Lanka! Suria Café, The Saujana Hotel Kuala Lumpur: Celebrating Flavours of Sri Lanka! When salivating aroma entices your senses, you know you are in for a great meal! 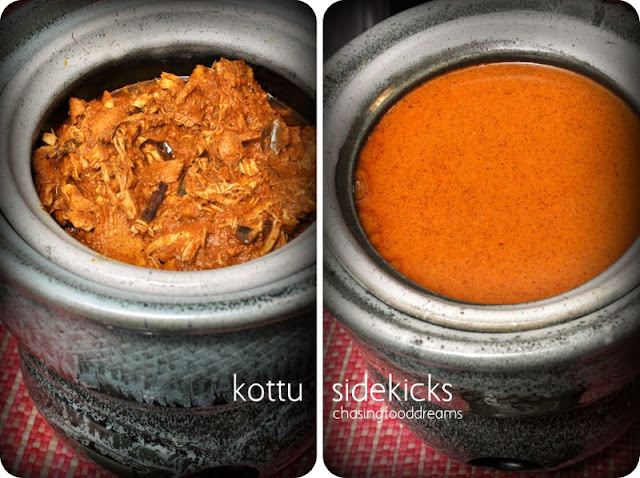 Three of the best chefs in Sri Lanka are here at Suria Café at The Saujana Hotel Kuala Lumpur to bring a kaleidoscope of authentic Sri Lanka flavours. All the way from Cinnamon Lakeside Colombo, the three chefs have brought in a Sri Lanka spread of dishes and heritage for Suria Café’s ‘Celebrating the Flavours of Sri Lanka’ promotion from 17 to 27 June 2013. Together with Executive Sous Chef Dodangodage Clifford Nishantha Perera, Seniour Sous Chef Liyana Arachchige Anura Wijesiru and Commis I Udaramba Gamaralage Chandana Jayanath Gunathilake, the trio is set to lure food aficionados with a sumptuous array of Sri Lanka feast. Besides a luscious array of authentic Sri Lanka dishes, there are also additional international and local dishes to tempt your taste buds! Sri Lanka cuisine is as complex as it gets. It is heavily seasoned with spices and the nation’s cuisine features rice with lots of various curries. My first taste of Sri Lanka cuisine and I am impressed. Despite the liberal use of spices, the dishes exude a wholesome balance of all the ingredients. Nothing overpowers and one can actually taste a great poise of flavours. Main dishes include Cashew & Drumstick Meat Mitikirata, Sri Lanka Fish Stew, Chicken Red Curry, Lamb Black Pepper Curry, Prawn Baduma, Pumpkin Kalupol, Maluwa, Long Beans & Mushroom Thelata, Dhal Temparaduwa and more. Be prepare to bury your spoon deep into the addictive curries to be smothered with traditional Sri Lanka Festive Yellow Rice and Red Rice. The Chicken Red Curry is simply marvelous in flavours. Thick, rich and creamy, it also has a tang of sourness undernote. I enjoyed the curry so much, I literally laced this with almost everything I ate. Lamb Black Pepper Curry has cubes of medium tender lamb braised in a spicy peppery sauce. Besides the distinctive taste of black pepper, there are also other spices in the dish to counter the peppers. Cashew & Drumstick Meat Mitikirata taste like no other curries I have ever had. The dish has loads of soft cashew nuts together with equal pieces of chicken. It has a nice aroma of the nuts and spices and flavours are surprisingly mellow and lightly creamy. Sri Lanka fish stew also has a mellow note but is creamy and rich with notes of spices. Despite the dishes being laced with spices, none of them taste similar at all. Its amazing how the chefs create the array of masterpieces with the various spices. Pumpkin Kalupol, Maluwa and Long Beans & Mushroom Thelata are good vegetarian dishes that produce a sweeter and spicier notes compared to the other meat and seafood dishes. Sri Lanka Festive Yellow Rice and Red Rice are to be savored with Gotukola Sambol, pickles, chutneys, raw onions and garlics. I am particularly fond of the Gotukola Sambol, made with Gotukola, finely shredded coconut meat, onions and spices. 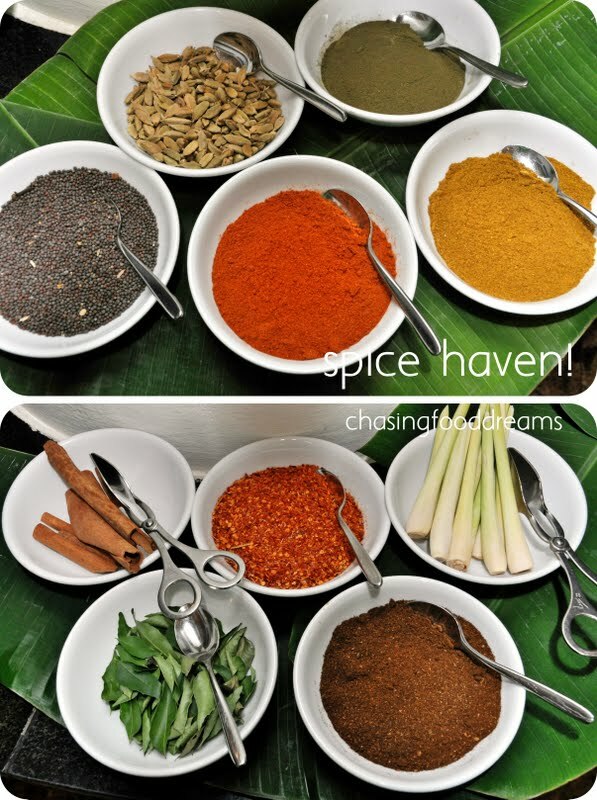 It adds an earthy and aromatic touch to all the curries. It may be humble but street food like Kottu and Appa symbolizes what Sri Lanka cuisine is at its best. Available everywhere in the streets of Sri Lanka, both are favorites of many. Once you had a taste, you will understand why these humble dishes are like our national favorites of satay and nasi lemak! Caught Chef Wijesiru whipping up a batch of the famous Kottu! Kottu is a noisy and delicious affair as it is made of roti and vegetables with the addition of meat, vegetables or even cheese. Traditionally made on a heated iron plate, one requires two flat blunt metal blades to perform a lot of chopping and clanging actions on all the ingredients together. To find Kottu, just follow the noise! The cuisine’s piece de resistance was Appa or Hoppers. Made in a small wok pan, a ladle of the thin batter made from rice flour, coconut milk and yeast or palm toddy, the hopper has crispy edges and a light spongy middle with a light sour tang. Simply spoon on some fiery chili sauce and a spicy onion and chili sambol and you are set for an unforgettable taste! Though I like it plain, I must say the Egg Hopper is out-of-this-world! It was so good, I had to go back for another. The chilies are spicy and linger around for a while, lending an addiction of flavours against the soft creamy eggs with hopper. Simply a must-have and so get one with the egg!! Come and celebrate the flavours of Sri Lanka in Suria Café at The Saujana Hotel Kuala Lumpur from the 17 June to 27 June 2013 as these three Lankan-teers battle with fire and wok! Diners may also stand a chance to win a luxurious stay at Cinnamon Lakeside Colombo when you dine at Suria Café during the Celebrate the Flavours of Sri Lanka promotion! Celebrate the Flavours of Sri Lanka promotion is available from 17 to 27 June 2013 for RM90++ for buffet dinner and RM70++ for buffet lunch. Ooooo...everything looks so good. I guess it would be similar in some ways to South Indian? I like!!! Extra spicy! Yum! Yum! Nice blog describing about Suria Café, The Saujana Hotel of srilanka. Here a good display shown of some of the srilankan cuisines . I must say these cuisines looks so delicious. If you want to know about florida hotels then you can find details in south florida luxury guide.